When the Eastman Kodak Company first began manufacturing its line of Brownie cameras in 1900, photography was still the domain of trained operators who charged considerable fees for formal portraits and commemorative images of formal occasions. Within the next ten years, however, snapshots became increasingly popular in American culture: holidays, birthdays, and even the everyday became occasions for photographic documentation. Eastman Kodak’s earliest models were simple black boxes held at waist level; retailed for $1, the Brownie’s slogan was “You press the button – we do the rest.” By the 1930s, though, new technical features and material advances had driven camera prices up substantially, and the firm was eager to develop a model accessible to users at its original $1 price point. Enter Walter Dorwin Teague, the celebrated American industrial designer. Teague, perhaps best known as an early pioneer of professional industrial design practice, enjoyed a long and productive partnership with Eastman Kodak from 1928 until the time of his death in 1960. 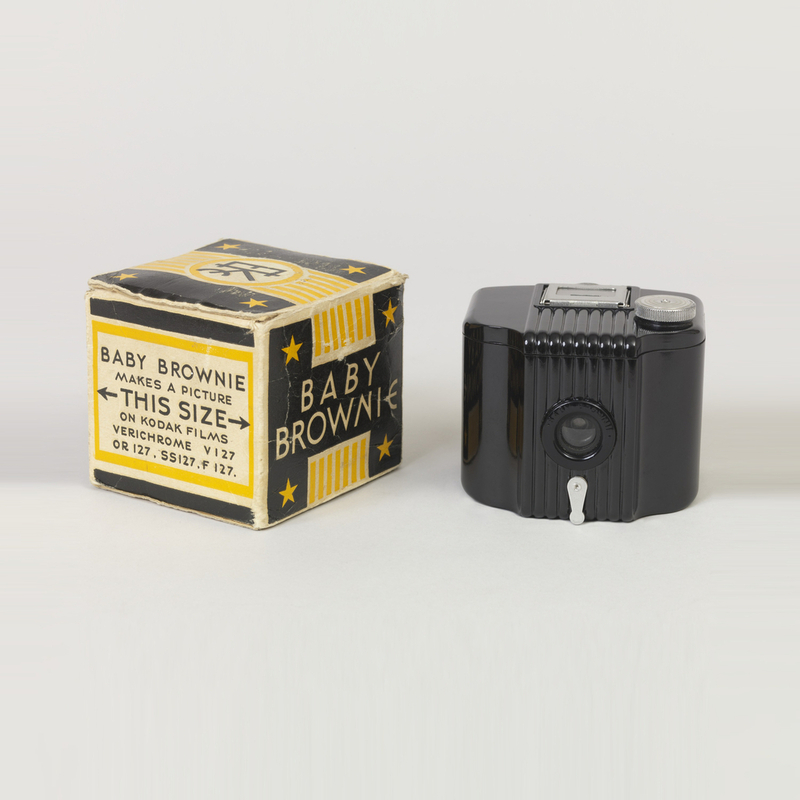 The prolific designer was responsible for infusing Kodak’s products with his distinctive art deco aesthetic, and the Baby Brownie is no exception. The compact device is encased in molded Bakelite plastic; like most box-style cameras, the cubic enclosure is comprised of two pieces latched together on either side. The lens is set into an undulating plane accentuated by vertical ribs that wrap the object and give it its art deco styling; this detail also appears on the camera’s packaging, underscoring Teague’s signature look. The Baby Brownie boasts an innovative folding-frame finder for composing images at eye- rather than waist-level with a shutter operated by a small metal lever directly below the lens. These American-made cameras were an enormous hit on both domestic and international markets, particularly in the United Kingdom, and a special commemorative edition of the Baby Brownie was issued for the occasion of the 1939 New York World’s Fair. In production from 1934 to 1941, Eastman Kodak sold over 4 million Baby Brownie cameras, a testament to the success of Teague’s stylish reimagining of the original Brownie as well as the increasing cultural importance of cameras and picture-taking. In addition to cultivating popular interest in photography, Teague’s design effectively created a new mass market for Kodak’s No. 127 film, one which remained lucrative until the 1960s when “Instamatic” cartridges and 35mm film replaced the once-innovative No. 127. The Baby Brownie is a product of fruitful collaboration between client and designer, one which set a precedent for both parties at the dawn of the industrial design profession. Still as popular today as a collectors’ item as it was when originally released, the iconic Baby Brownie encapsulates the style and spirit of its age and an optimistic faith in popular technology.